Process Objective: Service Support provides all operative Processes necessary for the handling of Service interruptions and for the implementation of Changes; the availability of the IT Services is thereby guaranteed. 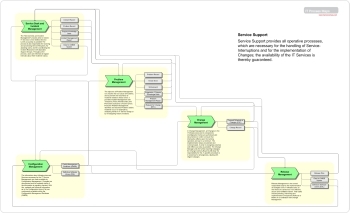 Process Objective: The "Service Desk and Incident Management" process aims to restore IT Services to their defined Service Levels as quickly as possible The process is also responsible for receiving and processing Service Requests, for assisting users, and for coordinating the Incident Resolution with Specialist Support Groups. Throughout the process, users are informed at regular intervals about their Incidents' status. Process Objective: The objective of Problem Management is to resolve the root cause of Incidents, and to prevent the recurrence of Incidents related to these errors. It provides Incident Management with Temporary Fixes (Workarounds) and Permanent Solutions to Known Errors. Proactive Problem Management identifies and resolves Problems before Incidents occur, for example by analyzing trends in IT Service Usage or by investigating historic Incidents. Process Objective: In Change Management, all Changes to the IT infrastructure and its components (Configuration Items) are authorized and documented, in order to ensure that interruptive effects upon the running operation are kept to a minimum. The implementation steps are planned and communicated, in order to recognize potential side-effects as early as possible. The Change Manager and (for further-reaching Changes) the Change Advisory Board (CAB) bear the responsibility for this. A specific procedure is in existence for emergencies, dealing with Urgent Changes. Process Objective: Release Management is the central responsible body for the implementation of Changes to the IT Infrastructure, so that these are carried out in an effective, secure and verifiable manner. Their tasks include planning, monitoring and implementation of respective Rollouts or Rollins in co-ordination with Change Management. Process Objective: The information about Infrastructure and Services necessary for the IT Service Management is made available by Configuration Management. Changes are documented and the updated status of the information is regularly checked. With this, updated and historical information as to the Configuration Items (CIs) are continuously available within the Configuration Management Database (CMDB). This page was last edited on 30 March 2019, at 11:43.